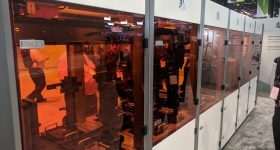 The 2018 3D Printing Industry Awards brought together the leaders of the additive manufacturing world, academic pioneers and many of the major figures in the 3D printing industry. 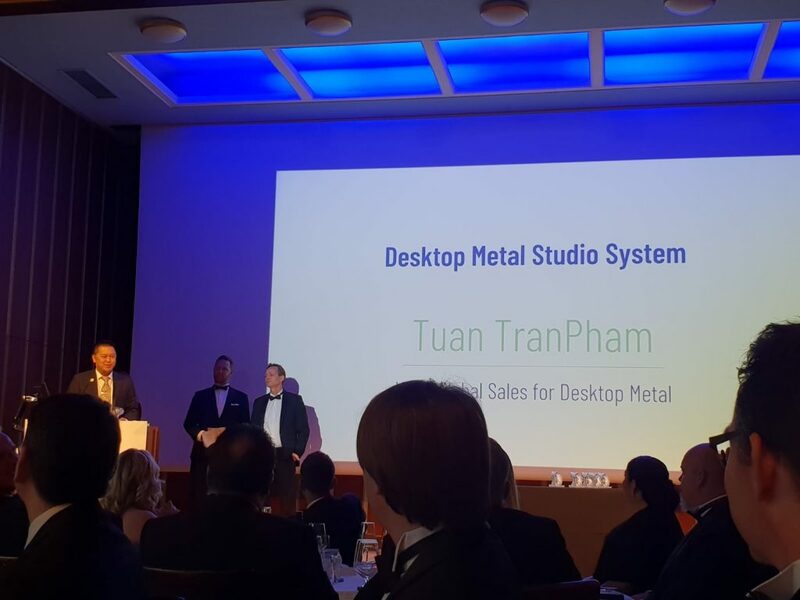 Protolabs at the 2018 3D Printing Industry Awards. 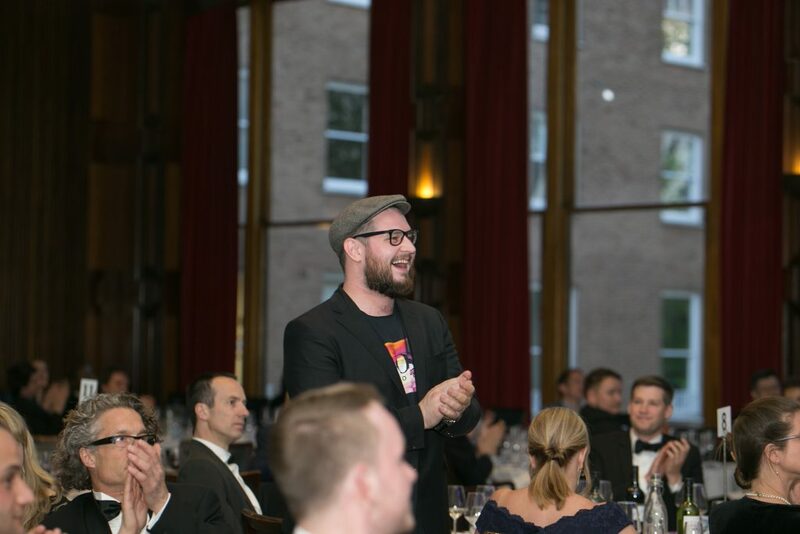 Now in its second year, the awards are unique in many ways – including the public voting system used to select the winners. 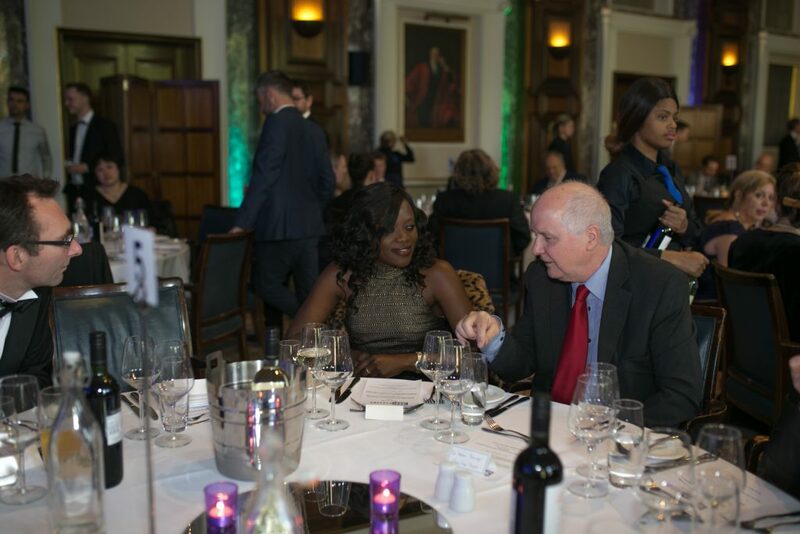 Over 150 guests representing more than 60 companies and institutions gathered at Nuffield Hall next to Regents Park in central London to find out who had won at our gala dinner event. 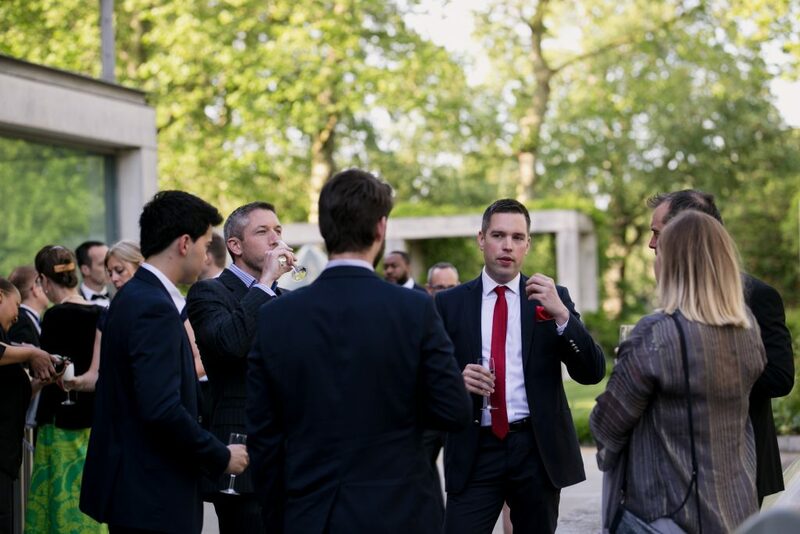 We were delighted to be joined by guests from the Manufacturing Technology Association, Innovate UK, the U.S. Embassy in London, and many more. 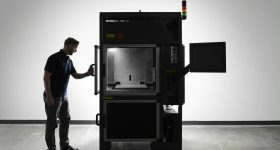 Voting increased by one third on the prior year’s awards, making this one of the largest surveys of the 3D printing industry – we’ll be publishing this data shortly. 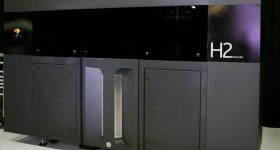 Read on to find out who won. 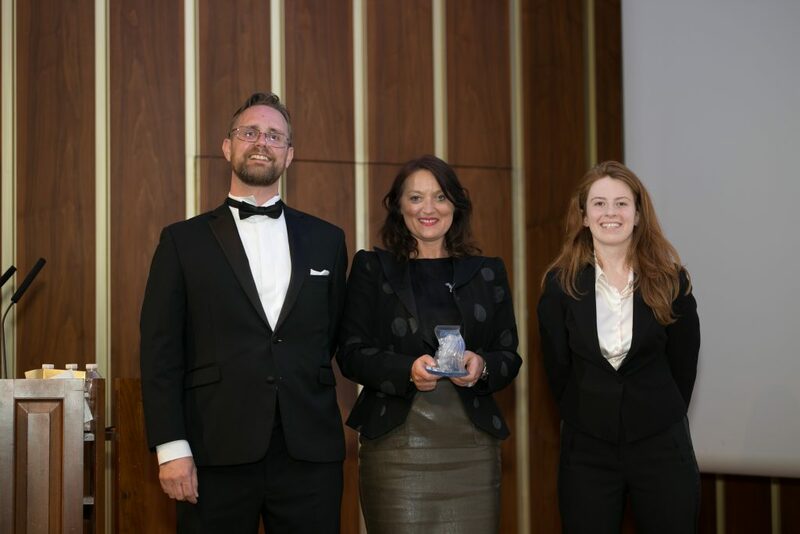 Fried Vancraen Founder and CEO at Materialise accepts the 2018 3D Printing Industry Award for Outstanding Contribution to 3D Printing. 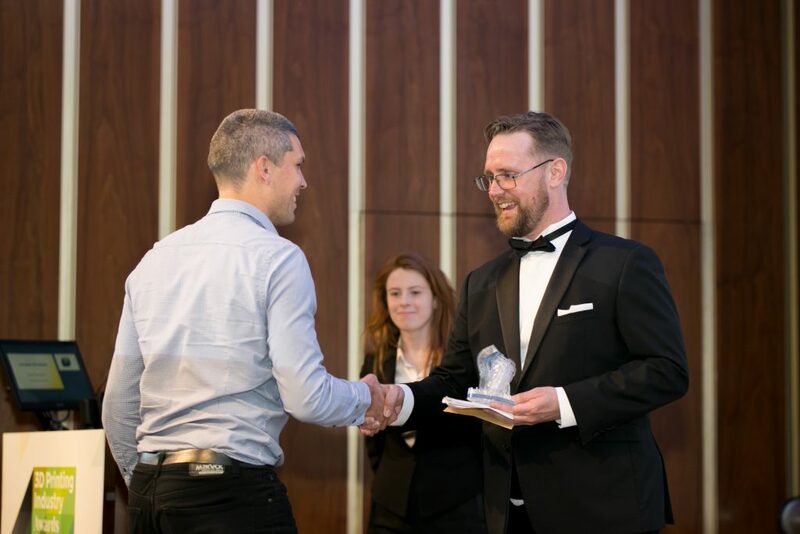 Siert Wijnia, CTO and Co-Founder at Ultimaker collecting the 2018 3D Printing Industry Award. 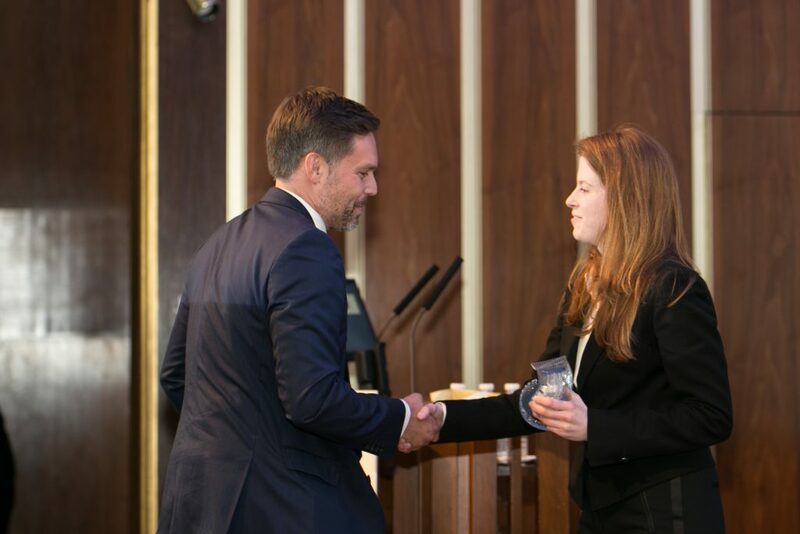 The award was presented by Mahvash Siddiqui, Science, Tech and Health officer of the U.S. Embassy in London. 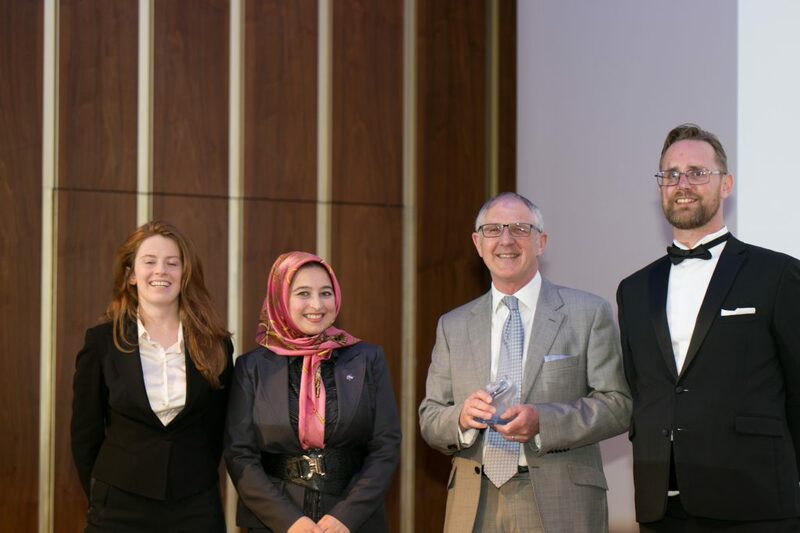 [L-R] Beau Jackson, Mahvash Siddiqui, Phill Dickens and Michael Petch. 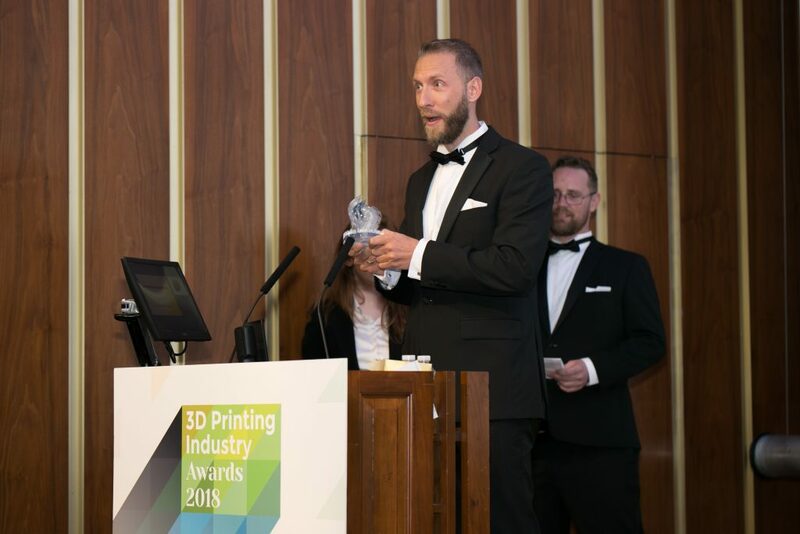 Koen Neutjens, Product Manager at Materialise collecting the 2018 3D Printing Industry award for 3D scanning application of the year. 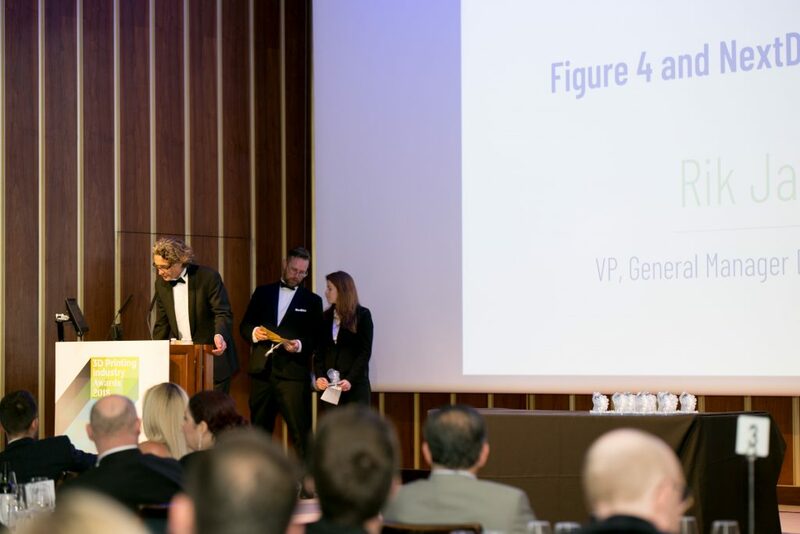 Daniel Cohn, General Manager, Protolabs Germany, 3D Printing, collecting the 2018 Creative Use of 3D Printing Industry Award. “Thank you all for the votes and the recognition. I am personally honored to receive this award. I am sharing it with our entire community of women who are advancing our industry, wherever they are, whatever industry they are coming from. 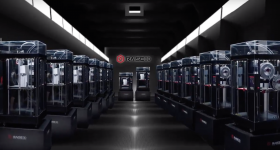 Women in 3D Printing is the community it is today thanks to them and their hard work. 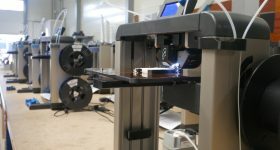 This award goes to all the women working in Additive Manufacturing,” Nora Toure, Founder Women in 3D Printing. 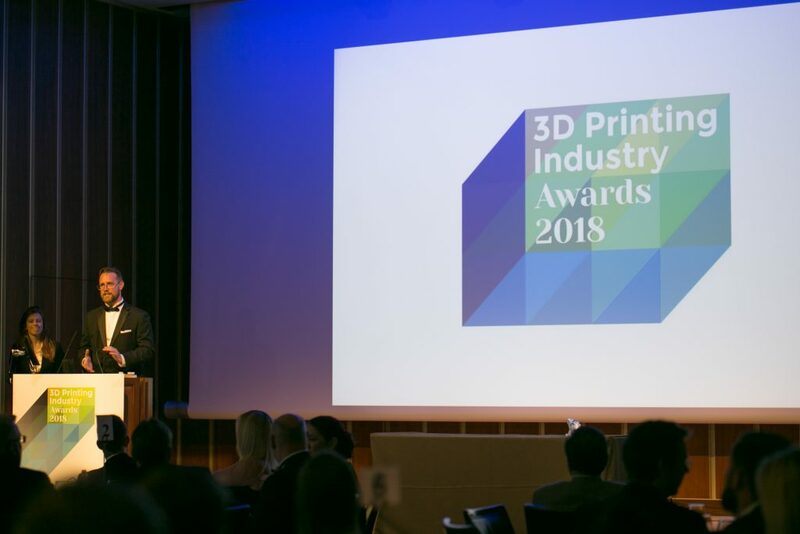 Kadine James, 3D Tech Lead, Hobs 3D at the 2018 3D Printing Industry Awards. 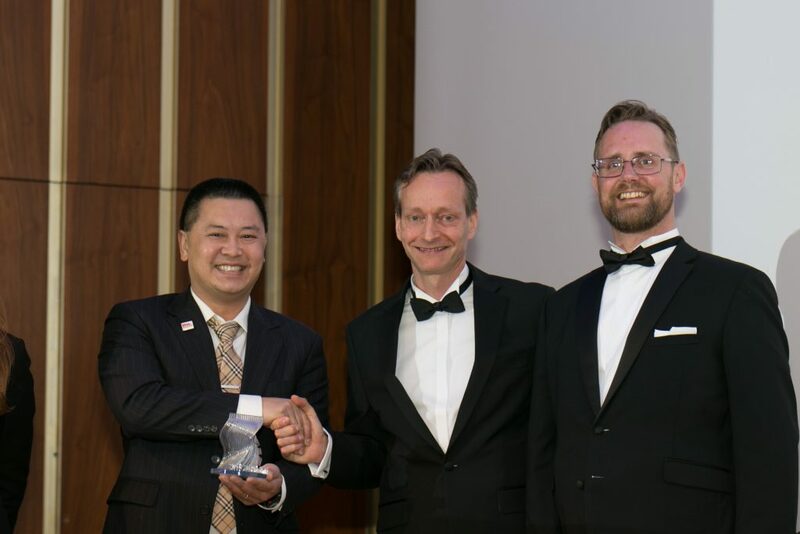 Dr Darren Budd, Commercial Director UK & Ireland, BASF plc collecting the award for Material Company of the Year. 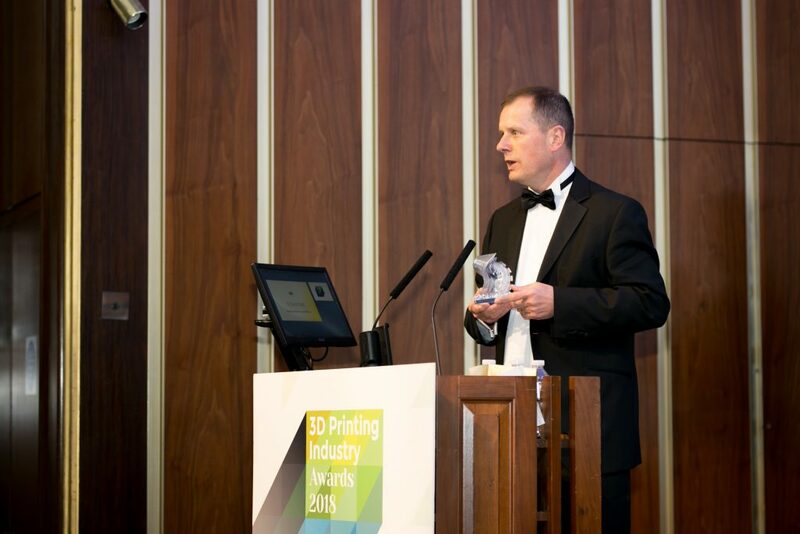 Neil Siddons, Communications Leader, GE Additive collects the 2018 3D Printing Industry Award for OEM of the year. 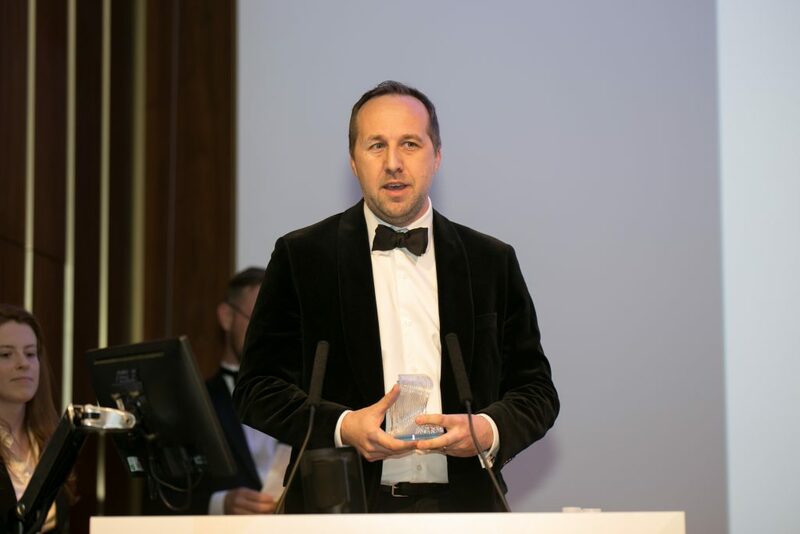 Dean Franks, Autodesk, Head of Global Sales, Additive Manufacturing collects the 2018 3D Printing Industry Award for 3D Software of the Year. 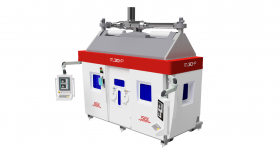 Rik Jacobs, vice president, general manager of dental solutions, 3D Systems. “We love this award (we display it in our lobby). 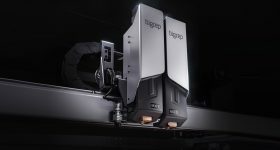 The only thing better than winning it once is winning it again!”, Greg Mark, CEO, Markforged. 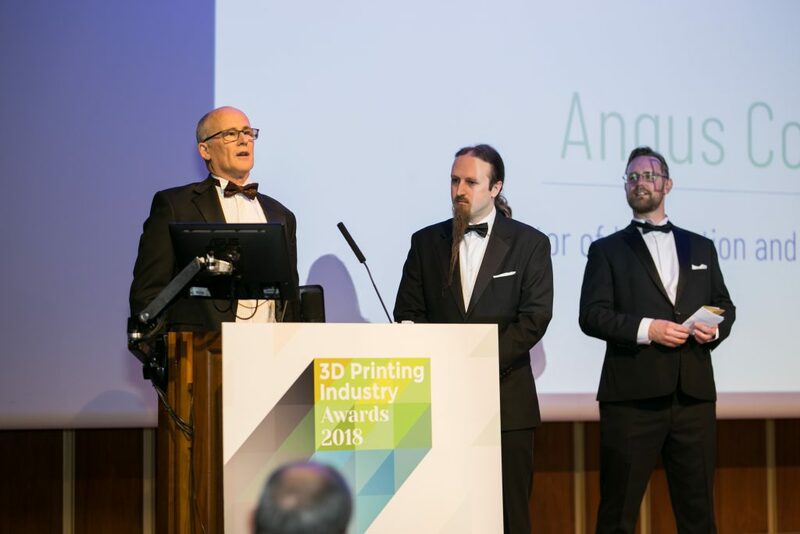 Sanjay Mortimer and Joshua Rowley from E3D at the 2018 3D Printing Industry Awards. 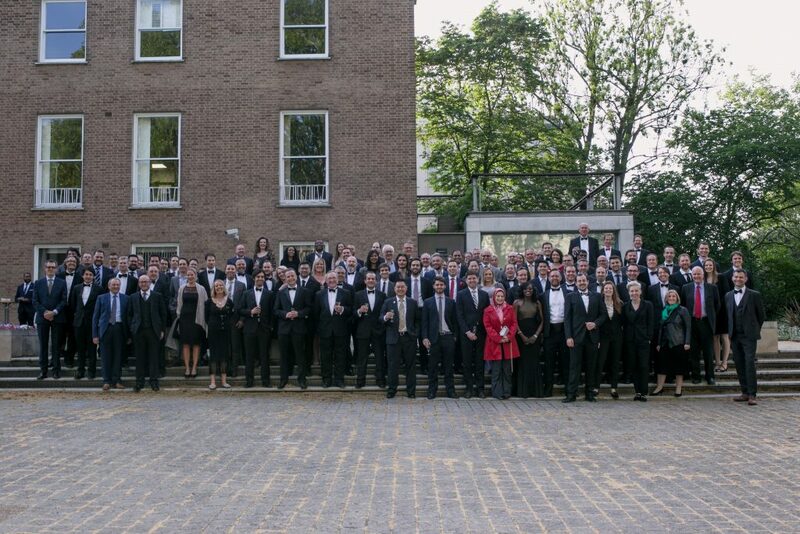 Bjoern Klaas, Vice president and Managing director for Protolabs Europe [center]. 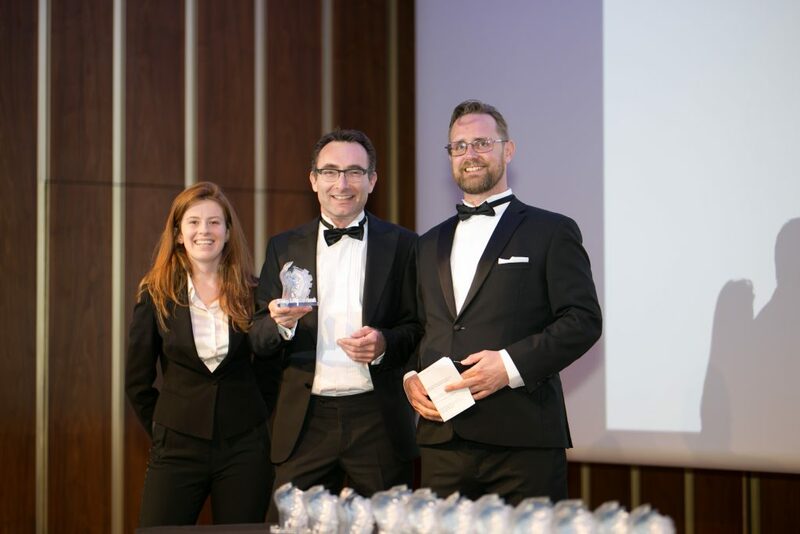 The Enterprise 3D printer of the year (Metal) award was presented by Bjoern Klaas, Vice president and Managing director for Protolabs Europe. 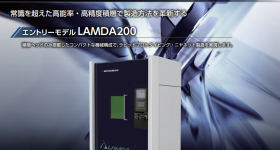 Winner – Additive Manufacturing Technologies (AMT) Ltd. 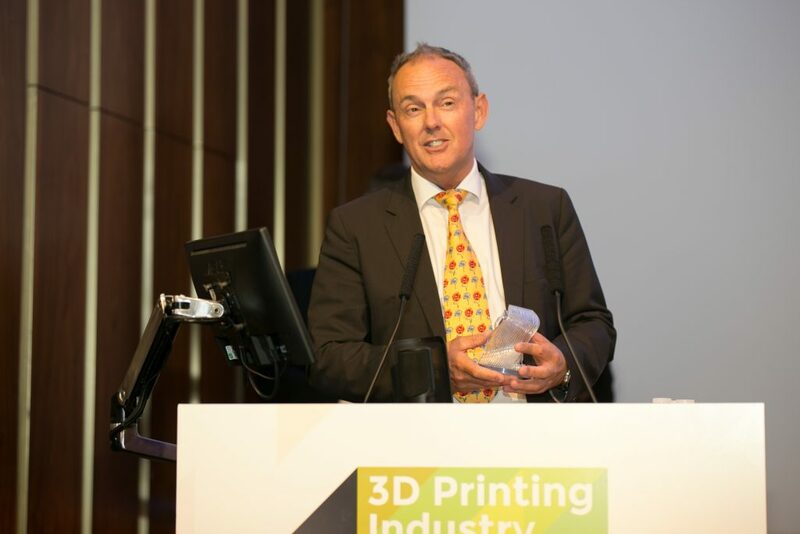 Additive Manufacturing Technologies CEO Joseph Crabtree at the 2018 3D Printing Industry Awards. 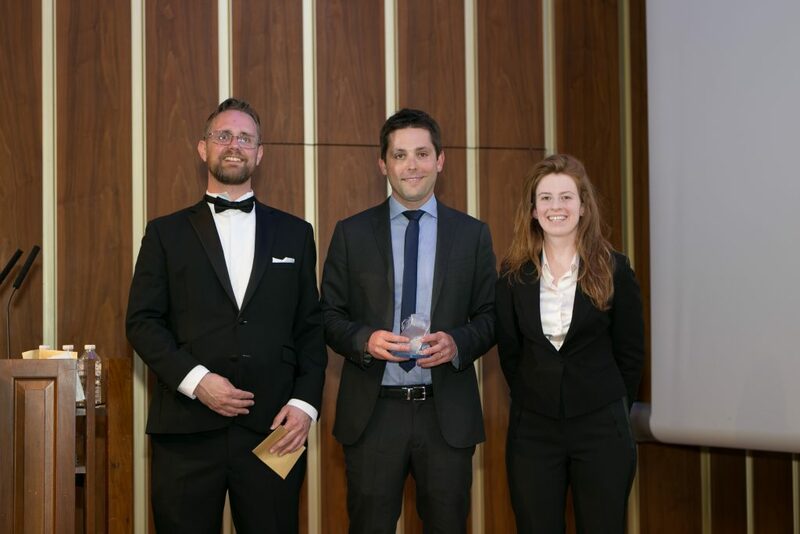 Jimmy Littman, Formlabs Country Manager for UK & Ireland collected the 2018 3D Printing Industry Award for the Form 2. 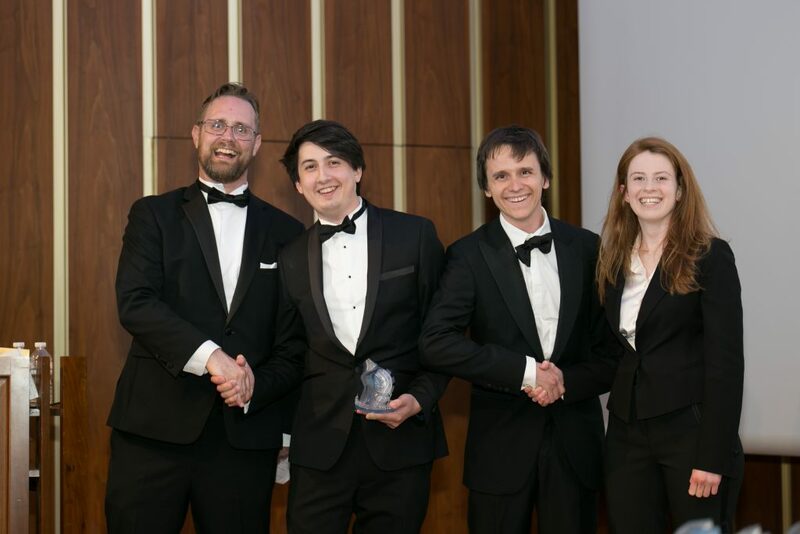 The award was presented by Dr. Adrian Bowyer, founder of the RepRap project. 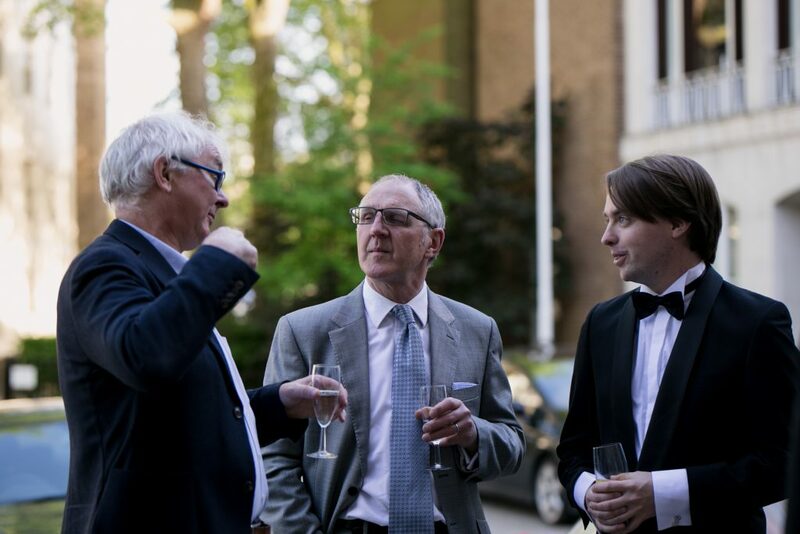 [L-R] Josef Prusa, Michael Petch and Dr. Adrian Bowyer. 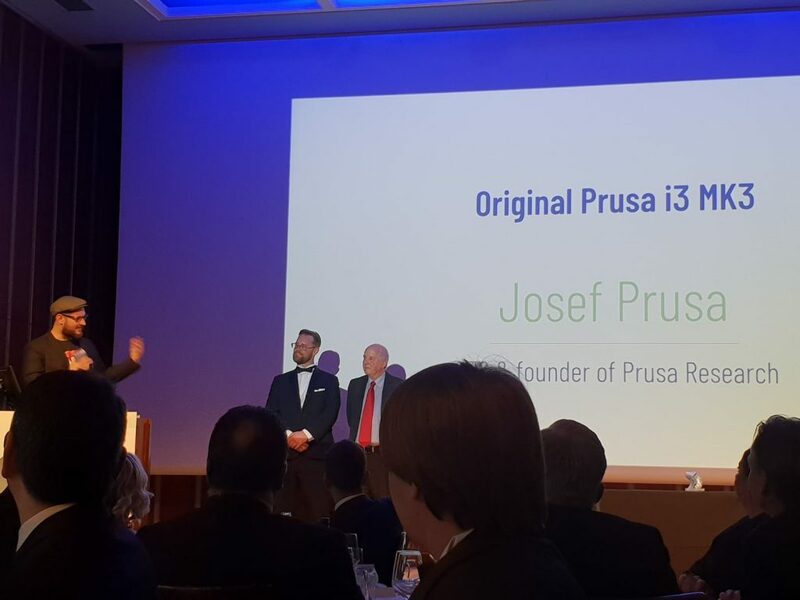 Josef Prusa, founder and CEO of Prusa Research. 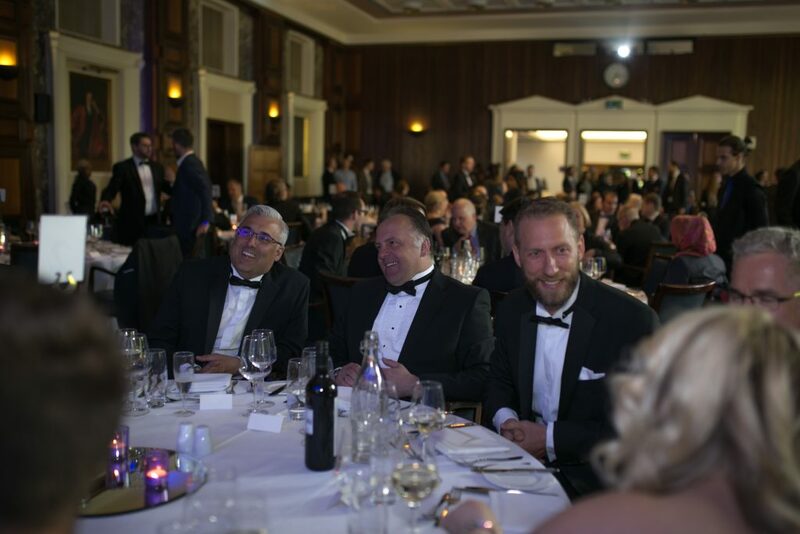 The 2019 3D Printing Industry Awards will take place on June 6th 2019. Contact us for early-bird ticket prices. 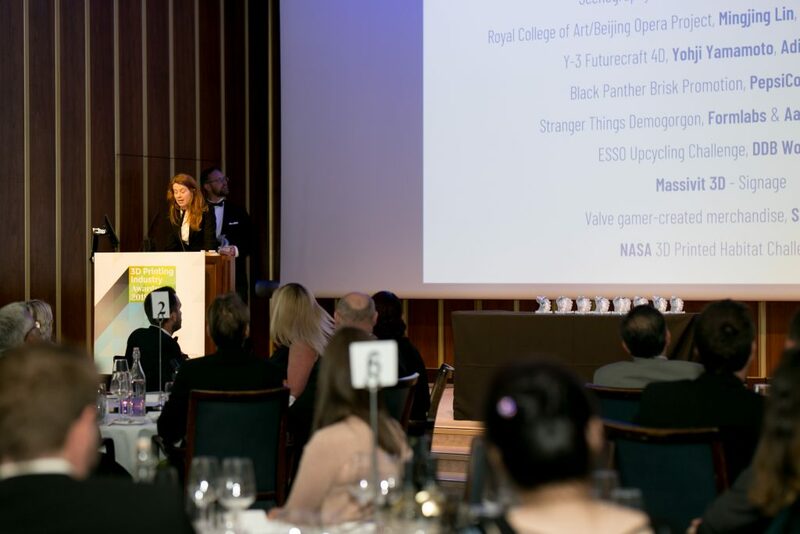 We will begin accepting nominations for the 2019 Awards in December. Make sure you subscribe to our newsletter to be the first with all the details. 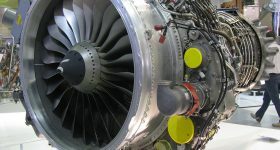 You can also follow us on Twitter, and like us on Facebook. 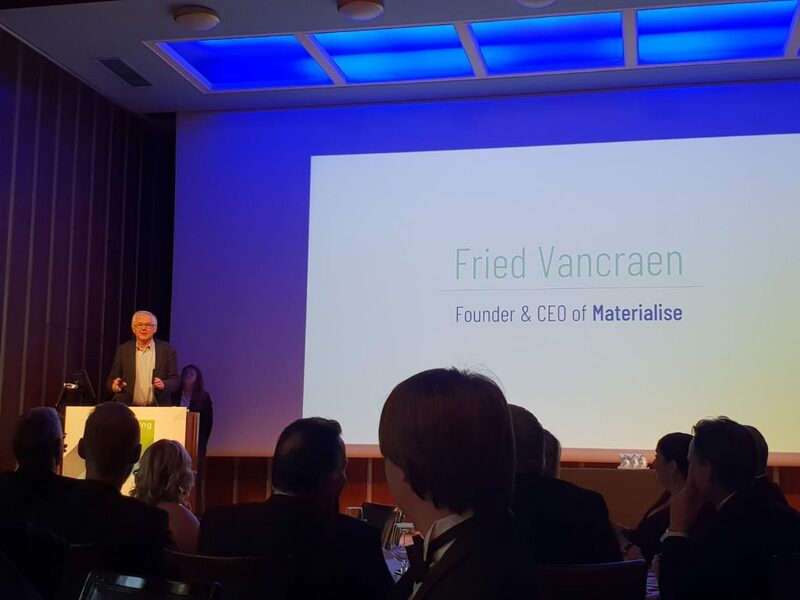 Featured image shows Fried Vancraen, Materialise founder and CEO at the 2018 3D Printing Industry Awards. Photo by Michael Petch.